When revenues drop, the Legislature often reduces the size of the capital budget. Last year, the state unrestricted general fund capital budget was $118 million, far lower than previous years and the smallest capital budget in 16 years. 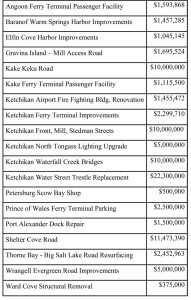 Significant parts of these state funds were used to match federal funds. Capital budget spending will remain nearly non-existent until revenues rebound for the state. 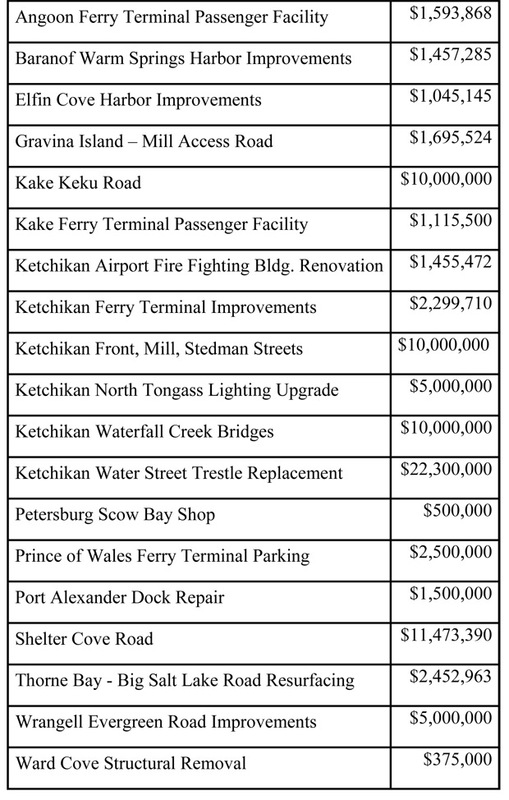 Nevertheless, the district had the following projects in the proposed capital budget SB 138. While that bill died at the end of the session, I expect a similar bill to be introduced by the Governor. The Alaska State Legislature adjourned out of regular session after 121 days of trying to come to an agreement on the bills that were before us in the legislature. Due to the magnitude of the state’s current fiscal situation and the complexity of the bills, which are now dead, both houses were unable to come to a compromise on the best possible solution for the future of our state. 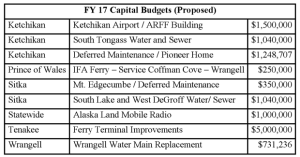 Operating & capital budgets for FY 17, which begins July 1, 2016. Governor’s Permanent Fund reform plan. An omnibus tax bill (income, motor fuel, alcohol, mining, fisheries, marijuana, and tobacco). Other non-revenue bills related to foster care & health insurance. The Community Revenue Sharing program has been reformulated and renamed by the Legislature to the ‘Community Assistance Program’. The program’s annual expenditure of $60 million is being cut in half to $30 million. In addition, the formula has changed so the larger cities of the state will receive substantially less and the smaller communities will remain roughly the same; the communities in between these extremes like Ketchikan and Sitka will take a substantial hit as well. It is important to remain aware, however, that this program could be short-lived and communities should not rely too heavily on this revenue for their operations. As Chair of the Senate Health and Social Services Committee, my staff and I were involved with my colleagues in drafting and passing SB 74. My office will continue to work on ways to improve our Medicaid program throughout the interim. 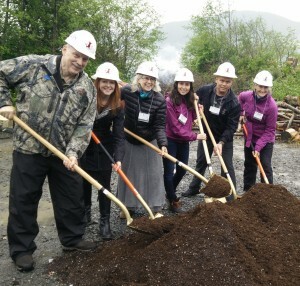 A groundbreaking ceremony was held on May 1st in Sitka to observe the beginning of the construction of an aquatic facility located on the Mount Edgecumbe High School (MEHS) campus. The facility will provide recreational and educational opportunities to the students who attend MEHS. Most students who attend MEHS are from remote, rural communities along Alaska’s coast or interior rivers where it is difficult and dangerous to learn how to swim. According to the Alaska Bureau of Vital Statistics, drowning is one of the leading causes of accidental deaths in Rural Alaska. The reality is that learning to swim is an important facet to a well-rounded education in Alaska. The facility will also be available for training purposes by the Alaska State Troopers and the United States Coast Guard. The Aquatic Center will also house a rehabilitation center that will be used by the medical community. In addition, when available the swimming pool will be open for use by the community of Sitka. In the 2010 general election, a majority of statewide voters approved a general obligation bond package, which included the initial funding of $20 million for this project. In 2012, as Co-Chair of the Senate Finance Committee and working closely with the Department of Education, I was able to include the final $5 million needed to complete the project in that year’s Capital Budget. I look forward to the grand opening ceremony, which I am told is next August 2017.